Founded in 1981 and located close to the Pomeranian Science and Technology Park in Gdynia, Poland, Cezos specializes in designing and producing modern lighting systems based on LED technology. A member of the prestigious LED Light For You network Cezos is renowned as a reliable partner able to match the high standards required in designing and producing the controllers, modules as well as lamps that use LED diodes. Plants have been grown under artificial lighting conditions for decades but only recently with LED as the light source. LEDs save energy and can boost different growth phases for different species at different stages of their development. LED horticultural lighting can also be used to alter not only plant growth, but also their taste and appearance, by adjusting the spectral content and the intensity of the light over time. 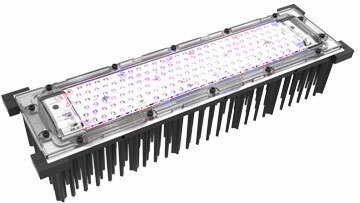 But it has been a challenge to create LED luminaires for horticultural lighting with good enough uniformity and control of the light spectrum to create optimal growing conditions. Cezos, from Gdynia in Poland, was tasked with developing an engineering kit to gather data and research best practice when combining a professional horticulture luminaire with OSRAM horticulture LEDs and LEDiL’s brand new horticultural optic DAHLIA. 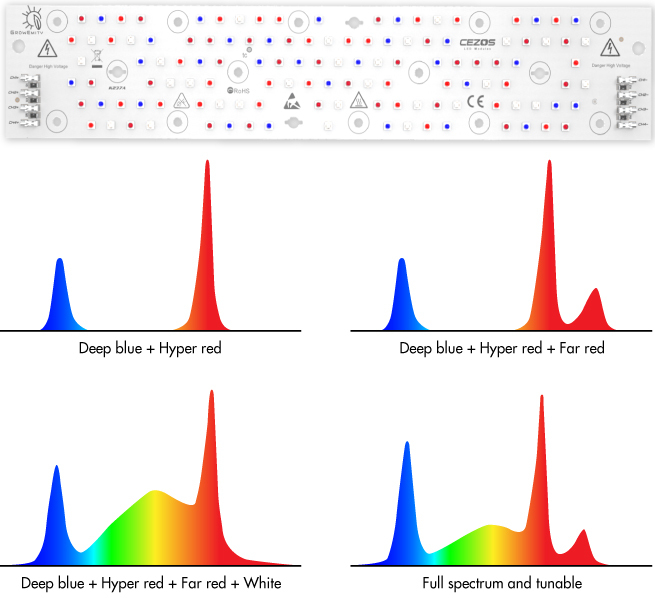 LEDs can be fully controlled, so the challenge lies in matching the light spectrum for specific plants by choosing the right LEDs, optimizing thermal design for high power LEDs and directing the light uniformly where it is needed with efficient and precise optics. Cezos has cracked the nut with its IP65 rated light engine kit optimized for greenhouse top lighting and domestic cultivation that leverages the high energy efficiency of LEDs to provide a cost efficient horticultural growing solution. 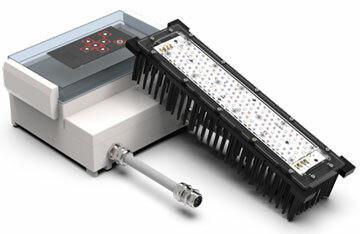 It allows for multiple LED configurations and is designed to accelerate plant growth and increase harvest. 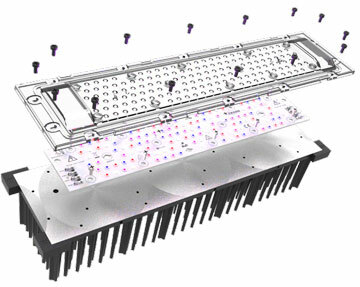 The four channels of the high thermal performance board can be individually adjusted to control intensity and light colour to suit the diverse needs and growth stages of the plant. To be effective the GrowEmity 120 required an optical solution to control the light and direct it for maximum effect. Cezos chose to use LEDiL’s new optic DAHLIA with IP65 gasket. DAHLIA provides uniform light over a large area with its batwing type beam and fits 120 LEDs under one lens array allowing full control of the full light spectrum with various LED channels. The GrowEmity 120 has wide LED compatibility and has been tested with a combination of Oslon Square GH CSSRM2.24, SSL – GH CSxPM1.24 and GD CSxPM1.24 as well as LUW CQAR and GF DASPA2.24 to achieve the required light spectrum variations. The key to the success of the GrowEmity 120 is efficacy and uniformity together with the possibility to customize it for almost any growing condition. The GrowEmity 120 has been tested in laboratory conditions and the feedback from scientists has been very positive.